Like many of you, this week we’ll be celebrating Thanksgiving. We’ll be having some friends over to join us and our “boys”…and as we begin our preparations, Brian and I find ourselves reflecting on how thankful we are to have so many wonderful friends—like you–all around the world. Brian loves writing books and what a joy it is to know that his books have touched so many lives. Every day Brian receives emails and messages from loyal and devoted fans…writing to tell him how much they enjoy reading his books. All of these messages are wonderful…and yes, he does read and respond to each of them personally. This one was so touching, I asked him if I could show it to you…and of course, he said yes. Sometimes it’s easy to forget how much of an impact we have on others…this was a lovely reminder. 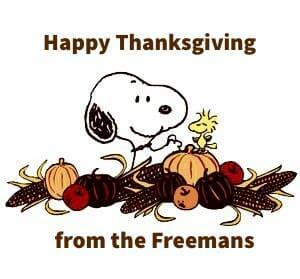 We’re thankful for all of you and the joy that you bring to our lives…Happy Thanksgiving to all of you…! Here is the email…just as it was written…. I am ****, and I have recently become acquainted with (aka addicted to) your work and your alter ego, Jonathan Stride. I have been a book junkie since the age of 8, when, at my second grade book fair, I purchased my first book with my very own money. The title was, “The Happy Hollisters Haunted House Mystery”. Fifty-eight years have passed, yet every moment of that purchase is clear in my fuzzy mind.